Why do we need prototypes in tourism? Innovation is a highly complex and uncertain process which explains the high failure rates. In fact, when facing innovation all actors (both private and public) operate under conditions of uncertainty during the whole process. Success or failure will largely depend on the entrepreneurs’ capacity to manage risks but also will depend on external factors in the product market or the financial market where policymakers can play a key role. While uncertainty pervades the whole journey of all actors, entrepreneurs specifically face different types of risks: operational, financial, personal, market-related, etc. Governments can influence the balance to help minimize the risks. Critical factors are: financial (persistent financial underperformance and impossibility to secure private investment), customer-related factors (lack of market credibility and trust, lack of understanding of the value proposal, insufficient funding for innovation diffusion, etc.) and insufficient knowledge (of the tourism sector or innovation/managerial key skills). Some of the mentioned issues have been summarized in a video format to reach a wider audience of practitioners and policymakers. 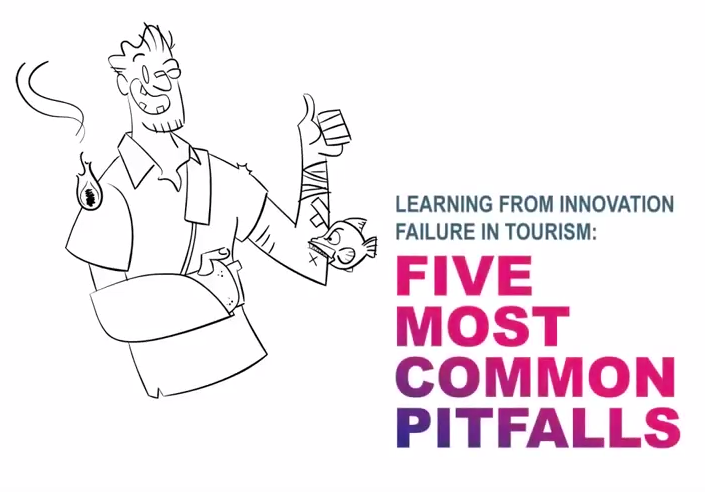 The aim of the video: “Learning from innovation failure in tourism - five most common pitfalls”, is to highlight in an accessible and humorous way the most common critical mistakes and factors reported by real-life entrepreneurs, mistakes either leading to failure or making the process more difficult. The video has been produced during the 2-year project INNOVATE (funded by EU Horizon 2020 Marie Skłodowska-Curie actions) which aims to deepen understanding of the different stages of the innovation journey followed by entrepreneurs in tourism to the design of more effective innovation policies. The project was conducted by Dr. Isabel Rodriguez and Prof. Allan Williams, which included an analysis of the innovation pathways of 70 entrepreneurs (some of them unsuccessful). Through in-depth interviews, the research has highlighted multiple types of risks that entrepreneurs could not overcome, and critical events and factors at different stages.